Earlier this week, a Brooklyn, NY tortilla factory employee died after falling into a waist-high dough mixing machine. Now, the state has closed the factory because authorities discovered the company’s workers compensation policy had lapsed in March 2010. 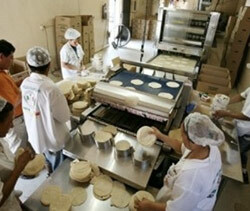 A NY State Workers Compensation spokesman said, “The owner would need to get the insurance and pay fines before he is permitted to reopen.” While the Workers Comp board doesn’t always shut down companies where the insurance is lapsed, the fact that there was a workplace death prompted officials to visit the tortilla factory. As it stands, the company owes $56,000 in penalties. OSHA and the Department of Labor are also looking into the incident. This $56,000 in outstanding penalties is sure to be dwarfed by lawsuits likely to be coming from the employee’s family and surviving members. All this could have been avoided or significantly curtailed if the factory owner carried the workers compensation insurance coverage required by law. The very core of workers compensation insurance is that it provides medical care for employees who are injured in the course of employment. Beyond medical care, Workers Comp insurance provides temporary and/or permanent disability benefits, supplemental job displacement benefits or vocational rehabilitation and death benefits. Workers Comp is a trade-off between employers and employees. Employees receive prompt effective medical treatment for on-the-job injuries or illnesses no matter who is at fault and, in return, are prevented from suing employers over those injuries. Unfortunately, business owners usually learn the hard way when it comes to a loss. This being a prime, and severe, example. Personally, I would be surprised if this business survives considering what surely lies ahead with lawsuits, etc.